The Action for Rail campaign joined forces with transport, disabled and older people’s campaign groups to condemn plans by London Mayor Boris Johnson to shed hundreds of staff across London’s transport. • Remove guards from trains on London Overground. Campaigners also fear the cuts could have an impact on staff employed in maintenance work across the network. London Underground is due to release further details of the proposed cuts next month. In his Spending Review earlier this year, the Chancellor announced a 12.5 per cent cut to the Transport for London (TfL) budget, to take effect from June 2015. Action for Rail fears that this cut could result in further job losses. • More than a third (34 per cent) said it would deter them making some journeys or make train travel difficult. Campaigners also highlighted that under the Mayoralty of Boris Johnson fares have risen three times faster than average earnings, contributing to the living standards crisis in the capital. Director of disabled and older people’s passenger group Transport for All Faryal Velmi said: “Underground staff play a key role in assisting disabled and older people to use the London Underground including accessing the platform and the train, particularly at stations with complicated access routes, or manual boarding ramps. “We are very concerned that if these staff cuts go ahead then access to the entire London Underground network will be restricted for disabled and older passengers”. – Action for Rail is the joint campaign of the TUC, ASLEF, RMT, TSSA and Unite, which campaigns against cuts to jobs and services and for a national integrated railway under public ownership that puts passengers and public first. 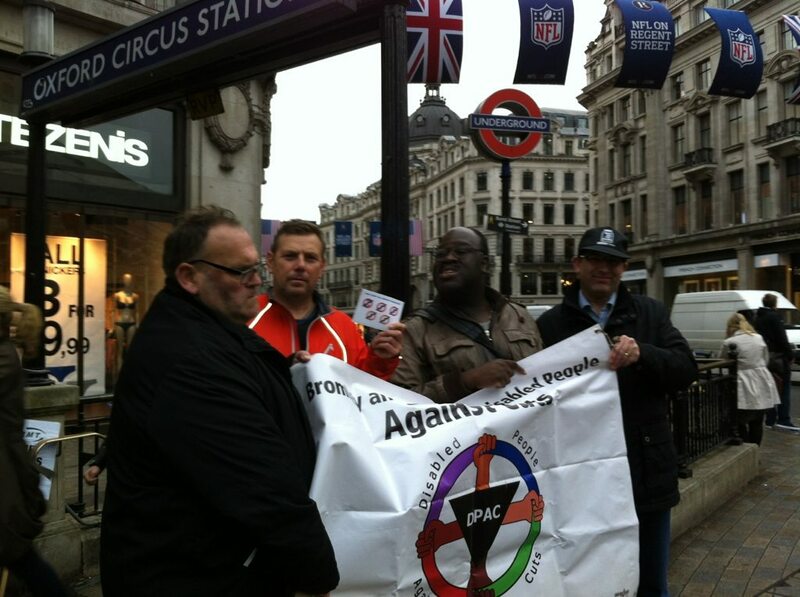 Day of action to make Crossrail fully accessible – Thursday 29th August 2013. Crossrail, opening fully in 2019, is new rail line linking Maidenhead in the West to Shenfield in the East, spanning London. Costing £14.5bn of public money this new rail line will not however be fully accessible to disabled and older people. Seven of the stations, including four London stations, will not be stepfree to platform. Hanwell in Ealing, Seven Kings in Redbridge, Maryland and Manor Park in Newham, have no lifts planned. A further three outside London (Taplow, Iver and Langley) will be out of bounds to wheelchair users and other disabled people. But making Crossrail stepfree would cost less than 0.2% of the £14.5 billion Crossrail budget. We’re campaigning for a Crossrail which everyone can use with freedom and independence. Day of Action on the 29th August! Come to Crossrail’s offices at Canary Wharf and join us to call for a Crossrail we can all use. One year on from the Paralympics, we’ll be holding our very own Legacy Torch Relay along the route of the Crossrail line. Our Torchbearers will be travelling by public transport from West and East, and converging around 11.30am at Canary Wharf. There, we’ll ask Crossrail representatives to work with us for an accessible Crossrail. Get information about how you can take action to help ensure Crossrail is a transport legacy we can all use and London can be proud of. Following the action, there will be a Pan London Mobility forum on Crossrail at City Hall. You must register in advance if you’d like to attend. Get your local MP to support EDM 336 which calls for a fully accessible Crossrail. WHAT DOES THE FUTURE OF RAILWAY STAFFING MEAN FOR DISABLED AND OLDER PASSENGERS? The government and rail industry’s plans to find savings of up to £3.5bn will place up to 20,000 jobs at risk and entail the de-staffing of a large proportion of our trains and stations. Disabled passengers may suffer as a result. Speakers from Transport for All, the National Pensioners Convention, Disabled People Against Cuts, rail unions and others will be invited to discuss their experiences of rail travel and the role that staff play in meeting their needs and to raise their concerns with MPs and government representatives. Boris claimed he was too busy to turn up at a London mayoral ‘hustlings’ organised by user-led organisations Inclusion London and Transport for all (TfA) to listen to disabled people. However, Boris can find the time to go to another ‘hustlings’ event organised by the big disability charities including RNIB, Leonard Cheshire Disability and MENCAP. The charities have not invited user-led disabled peoples’ organisations to attend. The big charities continue to speak FOR disabled people with no mandate to do so and continue to exclude disabled people from talks with local and national governments as always. DPAC asks: How much longer will user-led organisations and disabled people continue to be silenced by the multi-million pound charities? How much longer will people support the big disability charities without realising that they are acting in their own interests? Already Disability Works UK (a consortium of charities claiming a turn over value of £654.4 million) run workfare for disabled people, risking sanctions and loss of benefit for the very people the charities claim to ‘help’. They claim they dont do sanctions but this is because they pass on the names of people to DWP so that they can do them. Boris may be too busy to notice or simply not care- disabled people of London should care and make sure that his arrogance towards disabled peoples’ issues and the real problems we face translates into a ‘no vote’ for Boris in May.